Form Description: Request for debiting of an account. Includes billing and shipping addresses, order and invoice information, reason for debit, and space for itemized adjustments. Alternating lines in the itemization section are shaded for ease of reading. This form is in full-page portrait format. 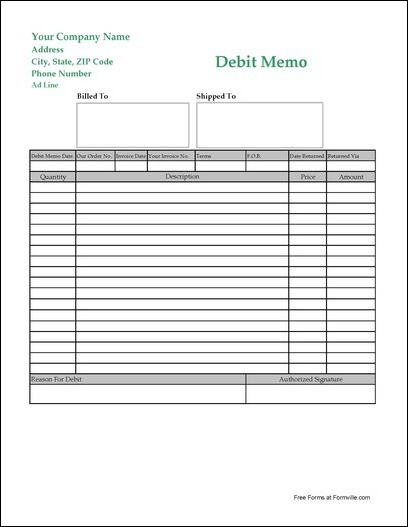 You can download a PDF version of the "Easy Read Long Debit Memo" form absolutely free. You can also, for a small payment, download a fully editable version of the form that you can customize as you desire. (Don't know which format to choose? Here's how to make your choice.) What would you like to do? Formville's free "Easy Read Long Debit Memo" form is associated with the following keywords: debit memo, debit.